Number of the Week: Risen by 44.6429% or by 0.0125%? Surface v. Atmosphere: Why the Difference? 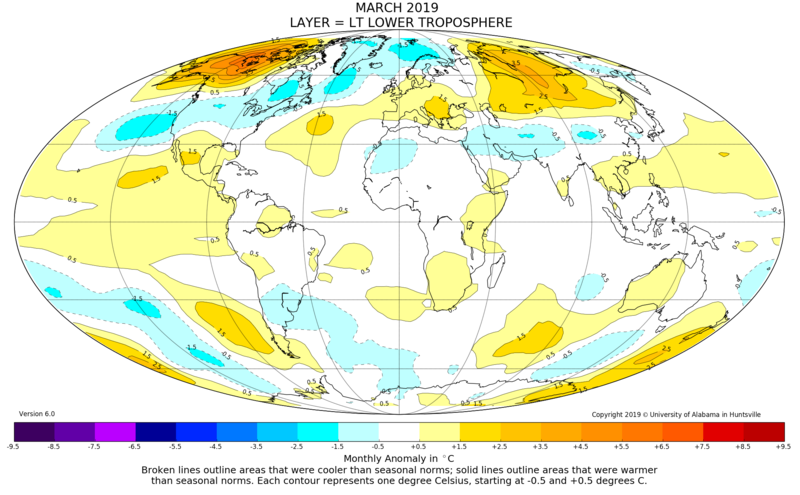 On his blog, Roy Spencer performs a statistical analysis to answer questions regarding the poor relationship (correlation) between atmospheric temperature trends and surface temperature trends in Australia. The Australian Government’s Bureau of Meteorology (BOM) posts a trend from 1910 to 2018, showing a significant temperature rise. The trend has been strongly questioned by Australian scientists, especially Jennifer Marohasy. Many of Marohasy’s comments have been carried by Jo Nova, on her blog. “The Darwin record has been the subject of international concern by sceptics because it plays a significant role in the global climate picture. “The Weekend Australian revealed last Saturday that the bureau had rewritten Australia’s temperature records for the second¬ time in six years, increasing the rate of warming since 1910 from 1C to 1.23C. The bureau has defended its homogenisation processes, which it said were needed to account for non-climate influences and changes in equipment. “Scientist Jennifer Marohasy said Darwin’s temperature record was important because the city was the only location in central northern Australia where temperatures had been measured since 1895 from within an instrument shelter. The Darwin record includes temperatures taken at Darwin post office from 1882 until 1941 and from Darwin airport from 1942 to the present. Spencer avoided the questionable “game playing” by BOM by examining only the record from the beginning of the satellite era: 1979 to present. Spencer uses the lower tropospheric temperatures, which cover the region of the atmosphere from the surface to where friction with the Earth’s surface influences air flow and is also called the planetary boundary layer. Definitions vary by scientific organization, but this layer is up to 2 km (1.2 mi; 6,600 ft) deep depending on the landform and time of day. What makes the article particularly interesting to TWTW are the adjustments Spencer makes to bring the BOM surface temperatures more in-line with UAH atmospheric temperatures – especially seasonal precipitation adjustments. Actually, he does the reverse. The base correlation is about 0.70 (resulting in a standard deviation calculated to be 0.57 deg. C) which is not particularly surprisingly low because the tropospheric temperatures over Australia can be affected by distant weather events, such as precipitation systems hundreds to thousands of miles away. The increasing difference between surface temperatures trends and atmospheric temperature trends, before statistical adjustments, is one reason why TWTW prefers using atmospheric trends. They give a better understanding of what is occurring in the atmosphere, where the greenhouse effect occurs. See links under Challenging the Orthodoxy and Measurement Issues – Surface. What is also interesting is that the strongest relationship between UHI and daily minimum temperatures occurs in the winter months. The relationship is insignificant for February through October. The paper discusses that previous studies using global scale temperature series show that UHI has negligible effect. Yet, other specific studies show a major effect. The inconsistency between local effects and global modeling is disturbing. The findings are similar to what Anthony Watts found when comparing surface temperature trends using high quality continental US data taken by compliant stations with non-compliant stations and NOAA data after adjustments. He found that NOAA adjustments increase the small warming trend found at high quality stations. Even on the surface, maximum temperatures are not rising as claimed by alarmists. See links under Measurement Issues – Surface. · “Back in the 1970s, it was determined using primitive computer models. The researchers came to the conclusion that their value is likely somewhere between 1.5 and 4.5 degrees. · “This result has not changed until today, about 40 years later. And that’s exactly the problem. “The difficulties he and his fellow researchers face can be summed up in one word: clouds. The mountains of water vapor slowly moving across the sky are the bane of all climate researchers. “First of all, it is the enormous diversity of its manifestations that makes clouds so unpredictable. Each of these types of clouds has a different effect on the climate. And above all: they have a strong effect. “Simulating natural processes in the computer is always particularly sensitive when small causes produce great effects. For no other factor in the climatic events, this is as true as for the clouds. If the fractional coverage of low-level clouds fell by only four percentage points, it would suddenly be two degrees warmer worldwide. The overall temperature effect, which was considered just acceptable in the Paris Agreement, is thus caused by four percentage points of clouds – no wonder that binding predictions are not easy to make. “You have to make do with more or less plausible rules of thumb. · A climate sensitivity of somewhere between 1.5 and 4.5 degrees was assumed, not supported by hard evidence, and it cannot be assumed to be correct. · The latest technologies for observing what is occurring in the atmosphere must be used, including atmosphere temperature trends. They are ignored by the Climate Establishment. The Greenhouse Effect – Absorption Capability: Over the past few weeks TWTW has discussed that, by volume, the concentration of water vapor in the atmosphere near the surface in the tropics is about 100 times greater than the concentration of carbon dioxide (CO2). The UN Intergovernmental Panel on Climate Change (IPCC) and the US Global Change Research Program (USGCRP) ignore this basic fact when making dire predictions of future global warming from greenhouse gases. When discussing the greenhouse effects of CO2, they use the concept of idealized dry air, which is found only in the laboratory. Yet, water vapor reduces the influence of other greenhouse gases, particularly carbon dioxide and methane, which will be demonstrated in the near future. The absorption capability of greenhouse gases in the atmosphere is very different from the absorption capability claimed by the IPCC – Figure TS.7 of the Technical Summary of the Fifth Assessment Report (AR5, 2013) gives the “Components of Radiative Forcing.” This was demonstrated in a paper by Allison and Sheahen discussed in the October 20 & 27 TWTWs. The authors presented a table (Table 2) based on unpublished data using calculations from the hi-resolution transmission molecular absorption database (HITRAN), at Harvard. The table produced by Allison and Sheahen showed the heat (photon) absorptive capability of individual greenhouse gas molecules relative to CO2 with a concentration change from zero to one part per billion, at the tropopause (11 km over the tropics). The value for CO2 is assigned to be 1; the value for CH4 (methane) is 0.22; the value for N2O (nitrous oxide) is 0.66; and for H2O is 0.14. At the tropopause, the absorption capability of methane is slightly greater than 4 times the absorption capability of CO2 – not the 200 plus times claimed by the IPCC. The concentration of methane (CH4) is about 1800 parts per billion or 1.8 parts per million (ppm), the concentration of CO2 is about 400 ppm. Yet according to the IPCC graph, the total forcing factor (RF) for CH4 is about .97 while the forcing factor for CO2 is 1.68, less than twice the total factor for methane. Obviously, the IPCC and the USGCRP do not bother to calculate what is actually occurring in the atmosphere. There is no logical reason to assume their models will produce realistic results. See links under Challenging the Orthodoxy, Defending the Orthodoxy and https://www.cfa.harvard.edu/hitran/. The National Climate Assessment, under the USGCRP, ignores the natural variation in climate change and claimed that major export crops of the Midwest had to be shifted farther north, to Canada. Apparently, the authors did not realize that the major competitor for the two biggest crops, maize and soybeans, is central Brazil, in the tropics. NASAs Goddard Institute of Space Studies (NASA-GISS), which ignores atmospheric data from space and specializes on sparse surface data influenced by many other factors, is closely tied with Columbia’s Earth Institute as is the Sabin Center for Climate Change Law. See links under Defending the Orthodoxy and Article # 2. Cold Comfort: The recent cold waves, called polar vortexes, brought unusually cold spells in the upper plain states of the US and Canada. In February, below-zero readings were common in Billings, Montana, some as low as minus 25 ºF. According to the Department of Natural Resources Canada, wind power can produce down to minus 30 ºC (minus 22 ºF), if the wind is blowing. That would be little comfort for those depending on wind power, if the low temperatures were accompanied by still air, which is often the case. See links under Alternative, Green (“Clean”) Solar and Wind. Paris Agreement – Executive Agreement? The Obama Administration made the Paris Agreement an executive agreement, not a treaty. A treaty would require concurrence of two-thirds of the Senate. A federal judge just ruled that an executive order cannot be changed by the new executive. See Article # 1. By Jock Allison and Thomas Sheahen, The Journal, The Official Publication of The New Zealand Institute of Primary Industry Management Incorporated, September 2018, pp 3 – 10. Carbon dioxide is not pollution. Our planet would be a wasteland without it. Link to paper: How much has urbanisation affected United Kingdom temperatures? CBC Claims Canada Warming Twice As Fast As Globe, Yet Data Tell A Different Story: No Warming In 25 Years! “A new research has shown that as the earth’s average temperature rises, so does human ‘heat’ in the form of violent tendencies, which links global warming with increased violence in human beings. “While the global warming science has recently come under fire, the main premise behind the Iowa State researchers’ research paper is irrefutable. ‘It is very well researched and what I call the ‘heat hypothesis’,’ a spokesman said. “Billions will die, says Lovelock, who tells us that he is not normally a gloomy type. Human civilisation will be reduced to a ‘broken rabble ruled by brutal warlords’, and the plague-ridden remainder of the species will flee the cracked and broken earth to the Arctic, the last temperate spot, where a few breeding couples will survive. “It is going to be a ‘hell of a climate’, he says, with Europe 8C warmer than it is today; and the real killer, says Lovelock, is that there is not a damn thing we can do about it. We are already pumping out so much carbon dioxide, with no prospect of abatement from the growing economies of China and India, that our fate is sealed. A federal judge rules that Trump can’t revoke Obama’s oil drilling ban. “No branch of government can bind its successors. Yet a federal judge last week divined an exception to this constitutional axiom by enshrining a Barack Obama order walling off 128 million acres of the Arctic and eastern seaboard from oil and gas production. Behold how liberals are attempting to entrench the Obama Presidency. “Until now it’s been understood that Presidents cannot permanently withdraw land from production. George H.W. Bush barred drilling off the Pacific Coast, North Atlantic and eastern Gulf of Mexico through 1998. Bill Clinton extended the moratorium through 2008, but this was partly rescinded by George W. Bush. “Enter Mr. Obama, who declared that the Arctic and Atlantic offshore areas, while too expensive to develop when oil was fetching $40 a barrel, needed to be permanently off limits ‘to move decisively away from fossil fuels.’ Shortly before leaving office, his Interior Department also tried to tie these lands in a double knot by excluding them from its five-year leasing plan. “President Trump rescinded the Obama oil blockade in April 2017, but 10 environmental groups sued. They argue that the Outer Continental Shelf Lands Act does not expressly allow a President to revoke a prior land withdrawal without Congressional approval. Taken to its logical extent this would mean a President can’t undo his own actions. “Federal Judge Sharon Gleason last week agreed with the plaintiffs in an outlandish opinion that ignores the law and constitutional principles. Judge Gleason first ignored that the green groups lack legal standing to sue since they haven’t suffered a concrete injury. Only after a five-year leasing plan is developed would the controversy be ripe for judicial review, and then the 1953 law cedes jurisdiction to the D.C. Circuit Court of Appeals. “But liberal groups wagered they’d get a more favorable reception in the Ninth Circuit Court of Appeals, and Judge Gleason obliged. Seismic tests may occur before a five-year leasing plan is set, she held in an earlier ruling granting the plaintiffs standing, and ‘if animals are exposed to high enough levels of sound, such as exist close to some seismic airguns, they can suffer shifts in hearing thresholds and hearing loss that may result in mortality,’ which could impair the groups’ enjoyment of the environment (our emphasis). These harms are all speculative. “In her decision last week, she ruled that if Congress had intended to let a President revoke a prior executive order, it would have said so as some other laws do. She concludes that Mr. Obama ‘intended [land withdrawals] to extend indefinitely, and therefore be revocable only by an act of Congress.’ Ergo, President Obama’s intent is supreme. “This contradicts the general constitutional principle that each branch of government can reconsider its prior actions. Congress may repeal or amend laws even though the Constitution only grants it explicit authority to enact them, just as executive agencies may revise regulations without Congressional instruction. The Supreme Court may reverse its precedents. “Many environmentalists have changed their minds about nuclear energy over the past decade. While the share of energy produced by solar and wind has grown rapidly, nuclear remains America’s largest source of clean, zero-emissions electricity. Anyone seriously interested in preventing dangerous levels of global warming should be advocating nuclear power. “But two-thirds of U.S. nuclear plants in the U.S. are at risk of being closed prematurely and replaced by natural-gas generation, which is currently cheaper in many states. If that happens, carbon emissions could increase by an amount equivalent to adding 47 million new cars to the road. “Ideally, the federal government would solve this problem, but between Republican skepticism of climate change and Democratic opposition to nuclear energy, that’s unlikely to happen before many nuclear-plant operators must decide whether to shut down. Thus the job of keeping these beleaguered nuclear plants open falls to state governments. “Lawmakers in Ohio and Pennsylvania are considering proposals to keep their nuclear plants operating. Ohio is at risk of losing two plants that produce 90% of its clean energy. Pennsylvania’s five nuclear plants produce nearly as much electricity as do all of America’s solar panels and farms. Nuclear accounts for 93% of the Keystone State’s clean, zero-emissions electricity. If Pennsylvania and Ohio’s nuclear plants close and are replaced by facilities that burn natural gas, it would be like adding 13.5 million new cars to the roads. “The fossil-fuel lobby’s objections to nuclear power are understandable. The American Petroleum Institute wants to replace Ohio’s and Pennsylvania’s nuclear plants with natural-gas plants because its members stand to benefit. But why do groups that claim to be concerned about the climate oppose nuclear power? “Some Democratic lawmakers in Pennsylvania and environmental groups such as the Natural Resources Defense Council are urging state legislators not to subsidize nuclear without increasing subsidies for solar and wind. While combining subsidies for nuclear with subsidies for wind and solar worked to get legislation passed in New York and Illinois in 2016, such an approach risks backfiring in Ohio and Pennsylvania, where state lawmakers are more fiscally conservative and tend to be skeptical of renewables. “Saving nuclear plants won’t be free, but keeping them open will keep electricity prices lower than if natural gas is allowed to dominate. Both Ohio and Pennsylvania still produce large amounts of electricity from coal, which is being replaced by natural gas. If both coal and nuclear plants are replaced by gas, ratepayers will be vulnerable to future price increases at the hands of monopolistic gas generators. “New York and California, meanwhile, are moving ahead with plans to close two nuclear plants. In the Empire State, Westchester County’s Indian Point will close in 2021 and, on the West Coast, San Luis Obispo’s Diablo Canyon will go offline in 2025. California is already set to miss its 2030 target of a 40% reduction in emissions below 1990 levels. If Diablo Canyon closes and half of its output is replaced by natural gas, there’s no way they’ll get there. “It is notable that while three natural-gas plants are being built to succeed Indian Point, local opposition to the construction of solar and wind farms has kept them from being built at anywhere near the rate necessary to replace the nuclear facility’s output. The authors close by arguing that the governors should take action in their home states.